It’s a price-point jungle out there. Here’s a shortcut for keeping up with your competitors. The monthly price point for your competitor’s video bundle just dropped by $.99. How do you know? Thanks to our Competitive Pricing reports, which deliver exhaustively researched, easy-to-digest analysis and compilation of pricing metrics down to the most granular of categories. Every business day we monitor published pricing for everything from home installation services to skinny video bundle subscriptions to provide your organization with comprehensive, customizable reporting around critical pricing indicators. In the arena of pricing intelligence, that’s called a winning bargain. With custom reports, One Touch Intelligence will identify and evaluate any combination of pricing metrics you select. 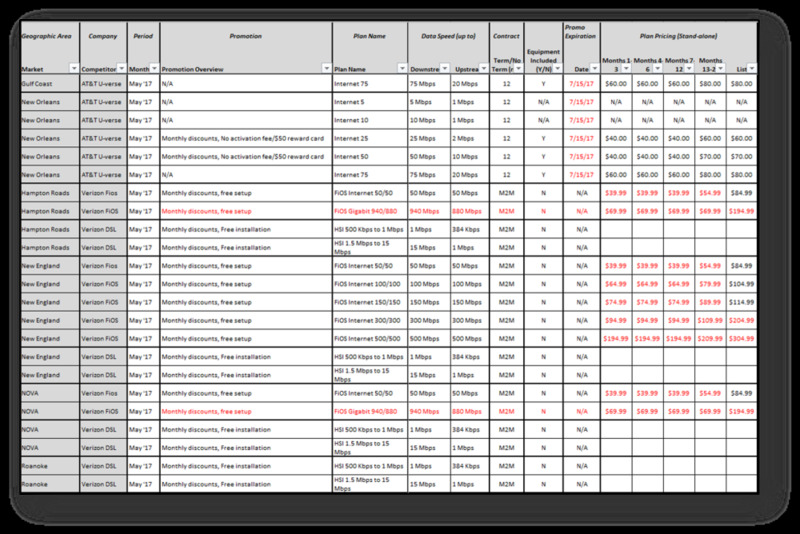 Drawing from our extensive pricing database, custom reports provide immediate insight that supports intelligent pricing and offering decisions. Sectors covered include: TV, Voice, Data, Gig, Bundles, Wireless, OTT and Home Security. A monthly synthesized view of product positioning, pricing and promotional initiatives undertaken by key competitors around service rates, equipment fees, one-time charges, premium service costs and more. Mix-and-match capabilities enable you to use the compiled data for comparative analysis across multiple providers to support strategic business decisions. On-the-spot notification of major pricing changes that alter the competitive dynamic in markets where you operate. With our continuous tracking and cataloging of competitor offers to identify changes affecting your marketplace, you’ll save invaluable staff time by leaving the searching, tabulation and reporting to a dedicated team of pricing experts. Delivered each quarter, these comparative views of linear channel lineups from key video providers allow for ready comparisons and agile evaluation of video services pricing and tiers.